Rihanna has sent beauty fans into a spin with a new makeup tutorial, in which she teases multiple upcoming products from her Fenty Beauty brand. The superstar stepped in front of the camera for Vogue.com, to take fans through her summer makeup routine, step by step. 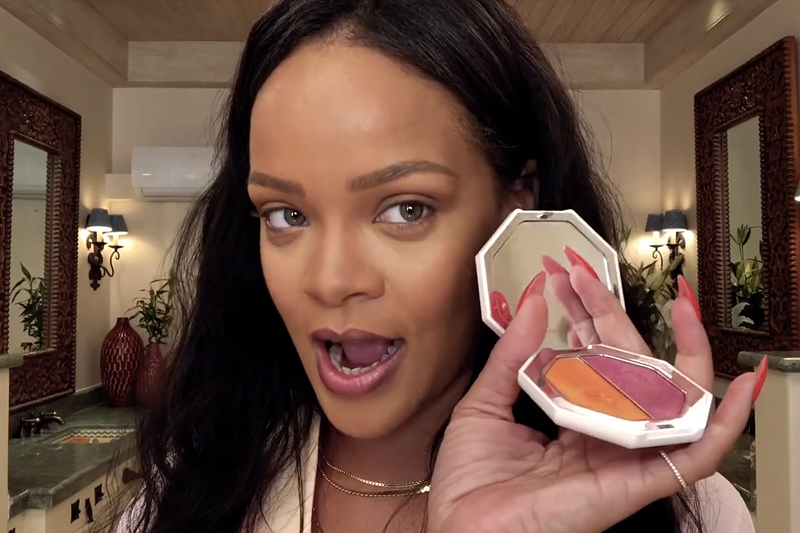 Naturally, the video shows that Rihanna's kit is full of existing products from her own makeup range, including her "Pro Filt'r Soft Matte Longwear Foundation" and "Match Stix Matte Skinsticks" for contouring and concealing ("Very important to contour your face for your face, not the way you see on every YouTube tutorial, because everybody has a different shape," the singer advises). Her "Invisimatte Blotting Powder" also makes an appearance. But then she whips out a previously unseen pink and orange compact that she uses on her eyes and cheeks, as well as a new shimmery blue and beige version that also appears to be a highlighter. An unfamiliar-looking shimmering metallic lip gloss and a dash of the star's "Body Lava" completes the look. An Instagram post from the official Fenty Beauty account, captioned "You ready? May 21, 2018," hints that the launch date could be just in time for summer. The move signals the latest in a string of high-profile launches for Rihanna, who dropped her "Body Lava" illuminizers and "Fairy Bomb" glitter puff back in April. The star is also set to unveil her brand new lingerie line, "Savage X Fenty," later this month.